Program participants and graduates from PHMC's Interim House and CHANCES programs went for a bike ride on the Benjamin Franklin Parkway with Mayor Michael Nutter on Friday, May 18, 2012, National Bike to Work Day. These women are part of Gearing Up, a nonprofit organization that promotes biking and bike education for women in recovery. Gearing Up was founded by Kristin Gavin when she was the fitness consultant at Interim House. Every year, Mayor Nutter promotes cycling on Bike to Work Day by going for a ride with representatives of local bike groups. 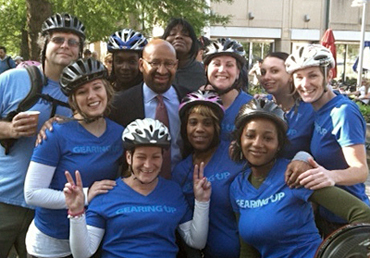 This year, he particularly called on the women from Gearing Up, Interim House and CHANCES, inviting them to bike up front and to stand on the podium with him at LOVE Park during his press conference. Click here to learn more about how biking skills contribute to women's recovery. The biking program at Interim House and CHANCES is just one example of the many innovative clinical, educational and skill building programs offered to women recovering from addiction and trauma at PHMC's behavioral health treatment programs.